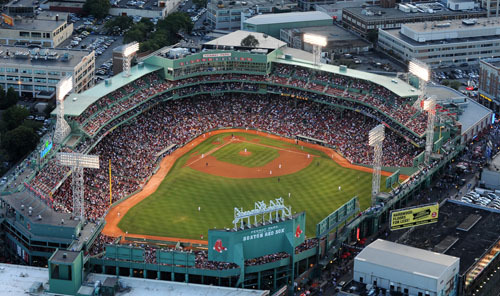 There's simply something special about Boston's Fenway Park and there's never been a better time to visit this baseball diamond gem than 2012. That's because 2012 marks the 100th anniversary of the home field of the Boston Red Sox--as well as the March debut of a new spring training facility and stadium for the Red Sox down in Ft. Myers, Florida. Built in time for the 1912 season, Fenway Park was named by then-Red Sox owner John I. Taylor, who said, "It's in the Fenway section of Boston, isn't it? Let's call it Fenway Park." Taylor had also changed the name of the team from the Americans to the Red Sox before the 1908 season. As the oldest Major League stadium still in use, Fenway Park's turnstiles first opened on April 20, 1912, for a game between the Red Sox and the New York Highlanders (today's New York Yankees). This April 20, they'll commemorate 100 years of history at Fenway Park with a massive pre-game ceremony fittingly followed by another Red Sox-Yankees match-up (both teams will wear 1912 throwback uniforms). Modern-day visitors will see that the ballpark is still a classic--though improved by the current creative ownership group with several improvements and expansions. Of course, there are many other opportunities for veteran and first-time Fenway visitors to see Fenway this season, including Home Opening Day on April 13, Throwback Day against the Oakland Athletics on May 2 and a full slate of home games through September 26 before closing the regular season on the road at two other great ballparks from the modern era: Oriole Park at Camden Yards in Baltimore and Yankee Stadium in New York City. Along with catching a game or two, tours of Fenway Park provide another great way to experience the stadium. The 50-minute historic walking tours are led by an official tour guide and can include a visit to the press box, taking in the view from the fabled Green Monster, and much more. Those who can't wait until April to get their baseball fix at the good old Boston ballpark can see the Red Sox at their brand new spring training diamond, JetBlue Park, at Fenway South starting in early-March in Fort Myers. The $80 million stadium will seat about 11,000 and includes a replica of the Green Monster and the original manual scoreboard from fabled Fenway Park. After playing a doubleheader against college teams from back home (Northeastern and Boston College) on March 3, the Red Sox will kick off spring training proper in the new ballpark against the Minnesota Twins on March 4, with 16 total home games on the spring training slate (which ends April 2).